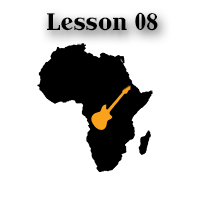 Learn finger picking with TAB with the help of the African guitar video series! In this example, we are going to explore a faster and more dexterous (looking) approach. At the same time, we are still in fingerpicking mode, with it’s alternating thumb bass line mode. The melody is on the top strings, of course. The above title pretty much sums it up. While the picking hand is playing the same general pattern we have discussed in the previous lesson, the tempo is higher this time. It results in faster movements of the fretting fingers as well, which means you have to pay more attention to learn properly what that hand does. During practice, I suggest you to keep your grip gentle on the frets. Your goal should be to get only as much pressure on the strings as necessary for getting clean notes. Anything stronger will cost you energy and time. In the first part of the piece, the pinky has a major role in fretting the higher strings to play the melody. The 2nd part is a bit less busy, but still has a little finger movement. You’ll find the correct notes to fret if you check the TAB, so don’t worry, you’ll get it right. 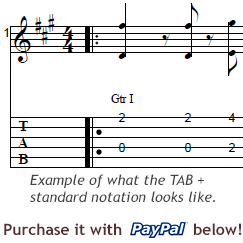 If you notice, there are notes in the bass/rhythm line that get played on the 3rd string (G). It means you have to move your thumb across the strings as kind of a cross picking to get those notes. This movement might be a bit unusual as far as fingerpicking goes, it does feel natural and logical for this tune, so just embrace it. The melody notes stay on the high E (1st) string during that part, so it will in fact help you to keep the same closed palm hand position, which is ideal for the three finger picking style.